Blade length : 71.8 cm or 28.27 inches. Sori :1.5cm or 0.6 inches. 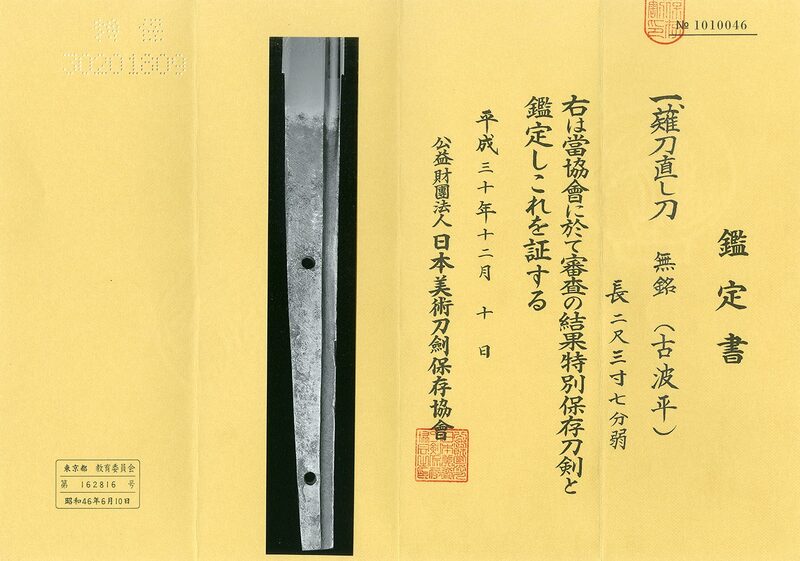 Width at the hamachi : 2.8 cm or 1.1inches. Kasane : 0.8cm or 0.315 inches. Era : Late Kamakura to early Nanbokucho period. with deep sori gorgeous Nagamaki style sword. Hamon :Niedeki suguha with thick nioiguchi and sunagashi, kinsuji work. and flat 波平 so ocean will be calm if officer hold naminohira sword and prayed. with Hokkoku jigane like Mougusa sword makers around Gassan area. and Mougusa is northern part of Japan very far from these districts. This word is wildish active Jigane and also nice suguha hamon. The blade might upgrade to Jyuyo Token. We recommend this long nagamaki wild feeling style sword. The style is gorgeous and the blade might pass upgrading Ju yo Token.